The Spanish philosopher and essayist, George Santayana quipped, The one who forgets the past is condemned to repeat it. 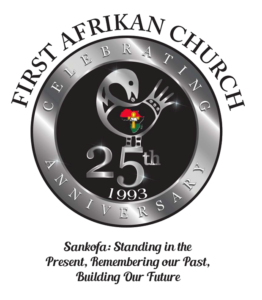 The 2019 Afrikan Liberation Month sermon and study series aligns with our 25th Anniversary theme which is Sankofa: Standing in the Present, Remembering our Past, Building Our Future. We commit ourselves to re-membering as we go back and fetch our collective beginning in liberation before walking and thinking and praying through our story of capture, enslavement, and continued struggle for full collective self-determination and freedom. Linguistically the prefix “re” can be translated as “again” or “back” depending upon the context of a sentence or the word to which it is attached. The word “member” on the other hand, signifies a person, animal or plant that is a part of a class or group. Nearly 48% of Afrikans in the Americas were captured in West Central Afrika where the French colony of Angola and later, the Portugese colony of Kongo were located. To re-member the Kikongo (the pre-colonized geographical location) in the context of this sermon series signifies going back to and connecting with the social, political, economic, spiritual group to which we, as Afrikan peoples, belonged prior to the great 400 year long Maafa (holocaust/destruction) of the European transatlantic slave trade. Theologically the idea of memory permeates both the Hebrew and Christian Bibles and experiences. The Church is called by the Creator through Yeshua to remember. The Greek word that best captures the idea of memory is anamnesis. Anamnesis means to bring the past into the present and thereby remember. It is best understood in relation to the Eucharist or Holy Communion where the Church remembers the sacrifice of Yeshua on the cross, eats bread and drinks wine and thereby becomes one with his person, ministry and Ausarian-like resurrection in the present. It means that the past is so powerful and important that it transforms all who remember it in the present. This is precisely why Afrikan peoples cannot and should not begin their spiritual practice of re-membering in enslavement. We must ever re-member freedom – those millennia during which our own notions of Spirit and ancestors and humanity and arts and sciences were preeminent. Philosophically the idea of memory is profoundly captured in the West Afrikan idea of Sankofa. Imaged as female bird, Sankofa insist that we go back and fetch it where “it” represents the life lessons of our ancestors, the shared wisdom of our elders, and our own collective and individual experiences. Sankofa compels us all to re-member the time(s) when our scriptures where lunar and stellar constellations, seasonal transformations, migratory patterns of fauna and flora, rock formations and various soil textures. Sankofa calls us to remember the signs of various human interactions and the symbols of nascent human groups left behind for succeeding generations. More than that, Sankofa demands that we return to the inner sanctuaries of our own minds and souls where the deep darkness becomes eternal light; that we relearn the habit of living life inside out; that we reject the sophomoric european imposition of living life outside in.